It is finally XC season! The first colds, the first snow and, as usual, the first cross-country races. November started with the long-waited Berlin and Brandenburg XC Champs, where I managed to get a 7th place in the long-distance (2nd in the age-group 30-35). Then a very intense measurements plan lead me to Kassel for one week, where I could enjoy a couple of track sessions in the beautiful main stadium. After the commitments related to the university, the “classical” marathon relay (now renamed to Airfield Run) allowed to run a pretty quick 5k for the Leidig24 Triathlon Team. Even if I faced a strong headwind for around 2 km, I still managed to run a 16’45” that, given the part of the season and the weather conditions, left me with quite a good feeling. Next, just a couple of days ago and always with the same team, I ran for the first time the Berliner Ruder-Club XC relay. A beautiful event indeed, with the interesting format of 4×6 km in the woods. Also, we won and that made the whole thing even sweeter! A lot of handshakes before the start (Berlin and Brandenburg XC Champs). Crowded start at the Berlin and Brandenburg XC Champs. 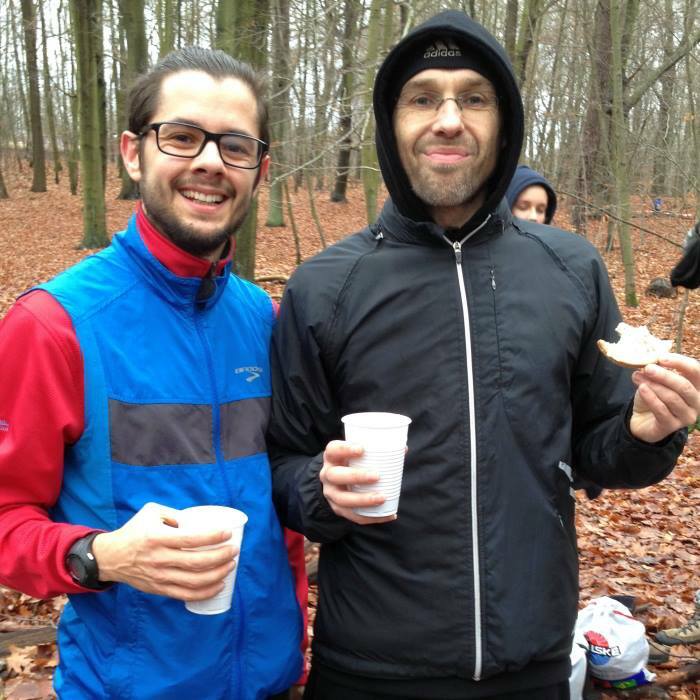 Enjoying a hot tea right after the victorious Berliner Ruder-Club XC relay. Holger Leidig (full left) and part of the Leidig24 team, right after the Berliner Ruder-Club XC relay. As usual, you can see all my training sessions details on the SportTracks mobi service. Su 01-11-15 Easy 20′, 2 strides, 3 x uphill reps circuit (downhill jog rest), CD. Mo 02-11-15 Easy 35′, legs and core strength. We 04-11-15 Slow 20′. Easy 15′, 2 strides, 4×500 m @ 3k race pace (200 m jog rest), CD. 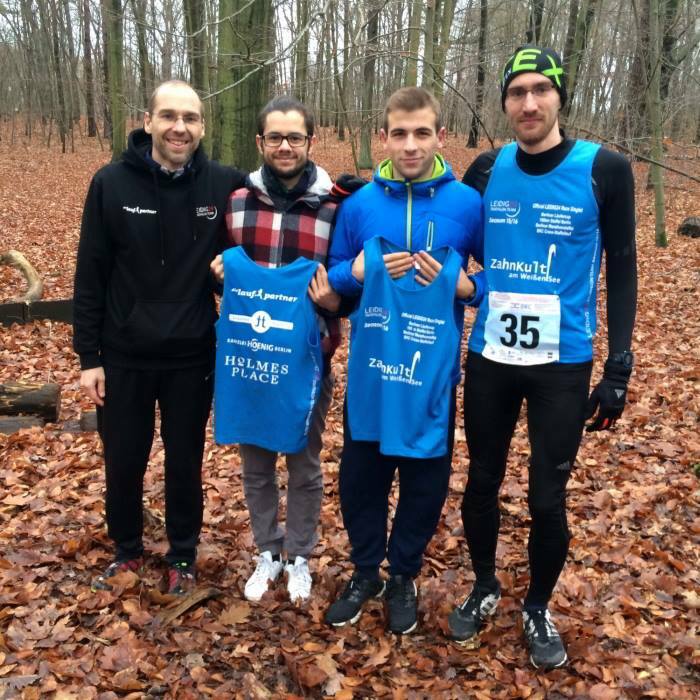 Sa 07-11-15 RACE: 9.6 km (BBM Cross – Luckenwalde). Mo 09-11-15 Measurements @ Kassel Uni. Tu 10-11-15 Easy 20′, 2 strides, 1×600 m (1’41”), 3′ walk rest, 3×300 m (54″-49″-47″, 100 m jog rest), 5′ walk rest, easy 4×200 m, CD. Th 12-11-15 Easy 30′, 2 strides, 1×800 m (fast straights, medium corners), 3′ walk rest, 3×200 m (200 m jog rest), CD. Sa 14-11-15 45′ with some XC. Su 15-11-15 Arms, legs and core strength. Easy 40′. Mo 16-11-15 40′ with some fartlek. Tu 17-11-15 40′ ice speed skating. We 18-11-15 Easy 40′ with some XC sections. Th 19-11-15 Easy 20′ with some strides. Sa 21-11-15 35′ jog, Adidas RUNBASE Berlin pre-opening, arms, legs and core strength. Su 22-11-15 RACE: 5 km (TÜV Rheinland Airfield Run – Berlin). Mo 23-11-15 40′ ice speed skating. We 25-11-15 Easy 15′, 2 strides, 1×600 m, 200 m jog rest, 1×300 m, 3′ walk rest, 4×200 m on grass (200 m jog rest), 15′. Su 29-11-15 RACE: 6.2 km (32. Berliner Ruder-Club Cross-Staffellauf – Berlin). Arms and core strength.